The Columbia’s shuttle fiery end came as the STS-107 astronauts’ families were waiting runway-side for everyone to come home. NASA’s oldest space shuttle broke up around 9 a.m. Eastern (2 p.m. UTC) on Feb. 1, 2003, scattering debris along east Texas and nearby areas. Its demise was captured on several amateur video cameras, many of which were rebroadcast on news networks. In the next four months, some 20,000 volunteers fanned out across the southwest United States to find pieces of the shuttle, coming up with 85,000 pieces (38% of the shuttle) as well as human remains. Meanwhile, investigators quickly zeroed in on a piece of foam that fell off of Columbia’s external tank and struck the wing. A seven-month inquiry known as the Columbia Accident Investigation Board eventually yielded that as the ultimate cause of the shuttle’s demise, although there were other factors as well. 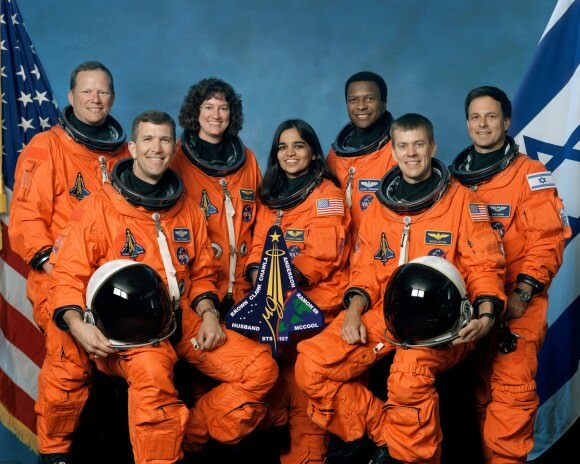 The disaster killed seven people: Rick Husband, Willie McCool, Michael Anderson, Kalpana Chawla, David Brown, Laurel Clark and Ilan Ramon (who was Israel’s first astronaut.) At a time when most shuttles were focused on building the International Space Station, this crew’s mandate was different: to spend 24 hours a day doing research experiments. Some of the work was recoverable from the crew’s 16 days in space. Columbia’s demise brought about several design changes in the external tank as NASA zeroed in on “the foam problem.” NASA put in a new procedure in orbit for astronauts to scan the shuttle’s belly for broken tiles using the robotic Canadarm and video cameras; shuttles also flew to the International Space Station in such a way so that astronauts on station could take pictures of the bottom. Airing on PBS stations in the US tonight (January 31, 2013) a new film in conjunction with the 10th anniversary of the space shuttle Columbia disaster. Space Shuttle Columbia: Mission of Hope tells the little-known story of Columbia astronaut Ilan Ramon from Israel, the son of Holocaust survivors who became Israel’s first astronaut. Ramon carried into space a miniature Torah scroll that had survived the horrors of the Holocaust, given to a boy in a secret bar mitzvah observed in the pre-dawn hours in the notorious Nazi concentration camp of Bergen-Belsen. The film premieres tonight at 9:00 p.m. EST (check local listings here) on PBS stations. It will be followed by an encore broadcast of NOVA “Space Shuttle Disaster” at 10:00 p.m. EST, which examines the causes of the tragedy. Most PBS specials are rebroadcast and are usually available later on the internet, and so check your local listings if you missed it, and we’ll also post a link if/when this film becomes available online. The conference honors the memory of the crew of the STS-107 Mission and in particular, the first Israeli astronaut, Ilan Ramon. Fourteen different leaders of various space agencies around the world will speak at the conference, including NASA Administrator Charlie Bolden. The conference will cover such topics as making spaceflight safer, and determining a global vision and future plans for continued space exploration. The feed will be broadcast in English with, with several English lectures and simultaneous translation for Hebrew talks. The event is organized by the Israeli Ministry of Science and Technology, the Fisher Institute for Air and Space Strategic Studies and the Israeli Space Agency (ISA). Universe Today thanks journalist Avi Blizovsky and Hayadan, the Science in Israel website for providing us with the live feed.